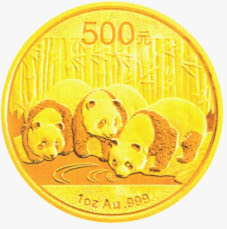 The 2013 gold and silver panda commemorative coins are to be released by People’s Republic of China on November 20th, 2012, which include 10 coins, 7 gold and 3 silver. 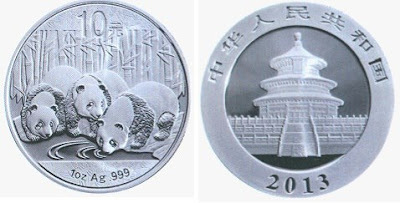 The front side pattern is the Qinian Palace of the Temple of Heaven, Beijing, the country name, and the year; the reverse pattern is the pandas drinking water, face value, weight, and fineness. (1) The 1/20 oz round gold commemorative coins are bullion coins, containing 1/20 oz pure gold, with diameter of 14mm, face value of RMB20 Yuan, fineness of 99.9%, and max. mintage of 800000. (2) The 1/10 oz round gold commemorative coins are bullion coins, containing 1/10 oz pure gold, with diameter of 18mm, face value of RMB50 Yuan, fineness of 99.9%, max mintage of 800000. (4) The 1/2 oz round gold commemorative coins are bullion coins, containing 1/2 oz pure gold, with diameter of 27mm, face value of RMB200 Yuan, fineness of 99.9%, max. mintage of 600000. (5) The 1 oz round gold commemorative coins are bullion coins, containing 1 oz pure gold, with diameter of 32 mm, face value of RMB500 Yuan, fineness of 99.9%, max. mintage of 600000. (6) The 5 oz round gold commemorative coins are bullion coins, containing 5 oz pure gold, with diameter of 60 mm, face value of RMB2000 Yuan, fineness of 99.9%, max. mintage of 5000. (7) The 1 kg round commemorative coins are bullion coins, containing 1 kg pure gold, with diameter of 90mm, face value of RMB10000 Yuan, fineness of 99.9%, max. mintage of 500. (8) The 1 oz round commemorative coins are bullion coins, containing 1 oz pure silver, with diameter of 40mm, face value of RMB10 Yuan, fineness of 99.9%, max. mintage of 8000000. (9) The 5 oz round silver commemorative coins are proof coins, containing 5 oz pure silver, with diameter of 70mm, face value of RMB50 Yuan, fineness of 99.9%, max. mintage of 50000. (10) The 1 kg round silver commemorative coins are proof coins, containing 1 kg pure silver, with diameter of 100mm, face value of RMB300 Yuan, fineness of 99.9%, max. mintage of 20000. The gold and silver commemorative coins referred above are minted by Shenzhen Guobao Mint, Shenyang Mint, and Shanghai Mint. Silver Gold Bull is a highly reputable precious metals dealer. They will provide you with reasonable, live pricing and they will make sure that your precious metals arrives to your door discreetly and securely.